Margaret Sue Johnson, age 87, died Tuesday, January 22, 2019 at Quality Health Care Center, Winter Garden. Born in Grant, Alabama to Timothy and Mary Province Parkhill, Margaret came to the area in 1973 from Orlando. 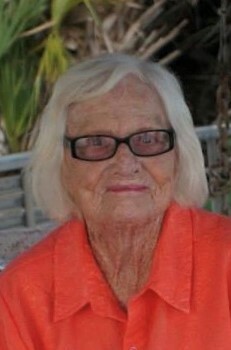 She was known as the unofficial Mayor of Bethune Beach, knew everyone at Bethune Beach and was very active in her community. Margaret was responsible for naming the fish streets in Bethune Beach. She was a member of the Jimmy Buffett Fan Club, loved painting and fishing. Her and her late husband belonged to a fishing club at one time and won tournaments. Survivors include 2 sons, Johnny (Dell) Johnson, of Clermont and Brian (Tammy) Johnson, of Charleston, South Carolina; daughter, Susan Johnson, of Houston, Texas; 8 grandchildren, Mary, Jeff, Tonia, Brenda, Kayci, Erin, Miller and Liam; 14 great grandchildren; 2 sisters, Leona and Gayle. Margaret was preceded in death by her parents, husband, L. M., 2 brothers, Robert and Paul and 2 sisters, Betty and Martha Jo. Funeral service will be 1:00 p.m. Saturday, January 26, 2019 at Settle-Wilder Funeral Home, with the Reverend Andrew Pollock, officiating. Friends will be received on Saturday, January 26, 2019 from Noon until 1:00 p.m. Burial will follow at Sea Pines Memorial Gardens, Edgewater. In lieu of flowers, donations may be made in Margaret’s memory to Artists Workshop of New Smyrna Beach, 540 Barracuda Blvd., New Smyrna Beach, FL 32168.